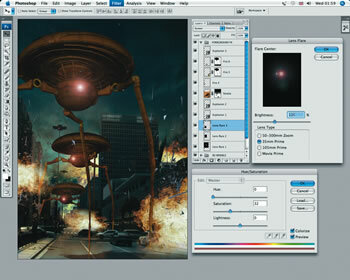 Seamlessly integrate 3D elements using Photoshop Extended. We’ll start off by transforming an everyday city scene into a war zone by incorporating a dramatic sky, then adding some spectacular explosion effects. 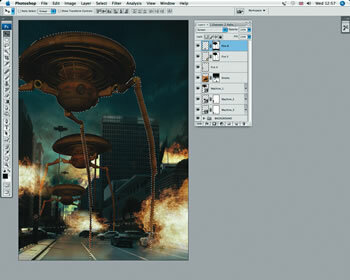 Next, we’ll use Poser to load and export some Martian war machines to wreak havoc in the streets. We’ll then build up the scene by adding some extra details, such as shadows and atmospheric effects using layers and blending modes. While a similar image could be accomplished using a dedicated 3D application, it would mean a steep learning curve for users who are new to 3D – which is why these techniques are ideal for Photoshop artists. 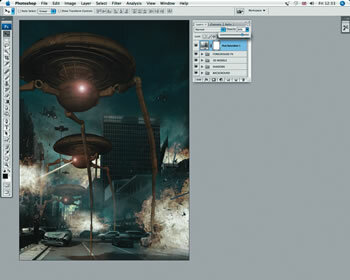 We’ve used CS3 Extended for this tutorial. If you’ve got CS4 Extended you can still follow along, though Adobe has moved the position of some of the editing tools in step 8. See the application’s Help pages for more information. 01. In Photoshop create a new RGB canvas at 300dpi in portrait orientation, measuring 21-x-29.7cm with the Background Contents set to White. The city image I have used here is by Wanner Cavagnolle and can be downloaded for free from tinyurl.com/dyx8so. 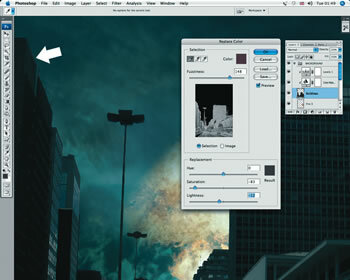 Open the city image in Photoshop and drag and drop it as a new layer into your working file. Resize as shown. 02. Switch to your Channels palette and cycle through each one in turn to determine which one holds the most contrast for buildings – in this case it’s the blue channel. Duplicate it by dragging the thumbnail into the Create New Channel icon. Open the Levels palette (Cmd/Ctrl + L) and set the black point to 169 and the white point to 242. 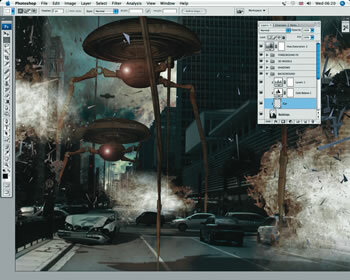 Now use a black, hard-edged brush to fill the buildings and a white bush to fill the sky. Draw closed paths around any remaining areas, then generate selections and fill them. 03. Cmd/Ctrl + click the Duplicate Channel thumbnail to generate a selection, then highlight your composite channel. 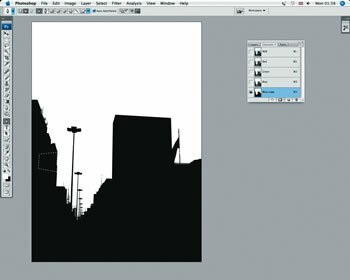 Switch to your layers palette and hit Cmd/Ctrl + J to float the selection as a new layer, then name it ‘Buildings’. Now delete the original, as well as the white background layers. Clip a Colour Balance adjustment layer setting the midtone red to -33, then clip a Levels adjustment layer setting the midtone Input to 0.66 and the Output whitepoint to 236. Add all these layers into a group folder called ‘Background’. 04. 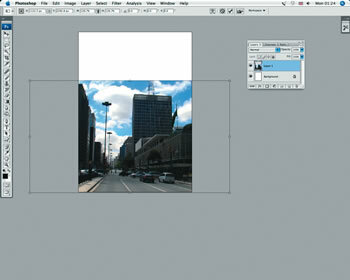 Open Sky.jpg from the cover CD and drag and drop it as a new layer beneath the ‘Buildings’, naming it ‘Sky’. Clip a Levels adjustment layer to it, setting the midtone Input to 0.75. 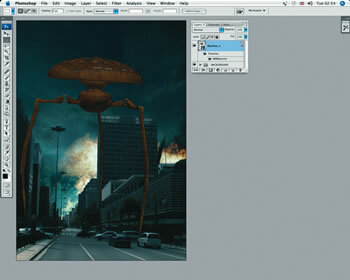 Next drag and drop Fireball.psd from the CD above the ‘Sky’ adjustment layer. 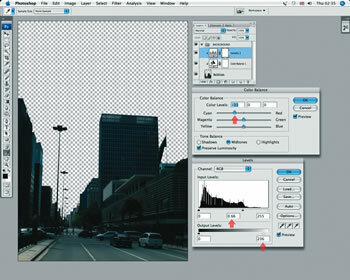 Set the blending mode to Screen and Transform (Cmd/Ctrl + T) and position it. Duplicate the layer a few times and re-size as required. Name these layers ‘Fire 1’, ‘Fire 2’, and so on. 05. Zoom in and check the edges on the ‘Buildings’ layer. You may need to defringe by a pixel or so (Layer > Matting > Defringe). Now eradicate any oddly coloured halos by selecting Image > Adjustments > Replace Color and picking areas with the Eyedropper. Now blend, using the Replacement Hue, Saturation and Lightness sliders. You can also use the Clone tool to erase the people crossing the road. 06. 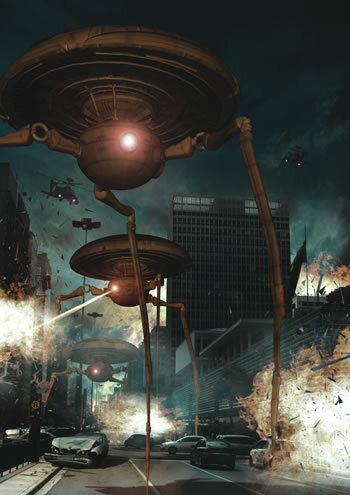 Our Martian war machine was bought for a small charge from Daz 3D. Download it from tinyurl.com/d7hr37. Install the Poser figure, then after reading the ReadMe files, launch Poser and load and pose the model as required. Now select File > Export > Wavefront OBJ, and in the next dialog box select Single Frame. In the Hierarchy window, tick the bottom geometry box and leave the Universe and Ground boxes unticked. You’ll then have to save and name the file – I called mine Machine_1.obj. It’s important to save this within a new folder. In the final dialog box, tick Include Figure Names in Polygon Groups, and Weld Body Part Seams. When the export process is complete, you’ll need to copy the texture into the folder you saved the .OBJ file in – these can be found in: Poser Application Folder > Runtime > Textures > KuroKuma. I only copied the MWMachine.jpg – as Meshwire1.jpg and Meshwire2.jpg apply to an unused prop and the others are Poser lighting maps. 07. Collapse the ‘Background’ folder, then import the model by selecting Layer > 3D Layers > New Layer from 3D File and navigating to the Machine_1.obj file. When the import has finished, you’ll see a new 3D layer indicated by a cube icon and its texture as sub-layer. Double-click the layer thumbnail to activate 3D mode and you’ll notice the toolbar changes. 08. 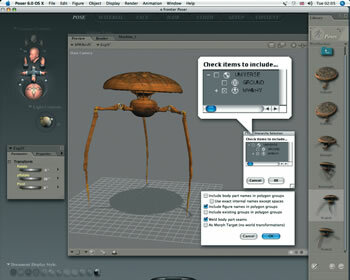 When the Edit icon is highlighted, here’s what each tool does: A returns the object to its original position; B rotates; C rolls; D drags; E slides; F scales; G lets you enter coordinates; H is a pop-out View menu; I deletes the current view; J saves the current view; K is a popout Lighting and Appearance menu; L is a pop-out crosssection menu; M shows animation settings; N cancels the transformation; and O commits the transformation. Use the following settings to position the model: 8.7322 for all Position fields; Orientation: X = 12, Y = 22, Z = 0 and 10 for all Scale fields. Then select the Single Light From Eye Lighting preset. 09 Add another tripod by duplicating your 3D layer. Use the Slide and Drag tools to pull it away from the foreground, then the Rotate tool to turn it slightly to the right. As this object is in the distance, you can position its layer beneath the foreground tripod. Now add a layer mask and paint out areas that would naturally be hidden, such as the right leg and the foreground vehicles. 10. Drop a slightly different posed tripod in behind the first two, then position and mask. Now open Sky.jpg again and use Quickmask to make a feathered selection. Copy and paste this above the tripods at the bottom of the canvas, then invert it (Cmd/Ctrl + I). Open Hue/Saturation (Cmd/Ctrl + U), tick the Colorize option and use the following settings: Hue – 33; Saturation – 64; blending mode – Vivid Light; opacity – 30% and label it ‘Smoke’. Next, add some foreground fire as you did in step 4, and name the layers accordingly. You can now add masks to the ‘Fire’ and ‘Smoke’ layers using Linear and Radial Gradients within selections generated from the tripod layers. 11. Organize your layers by adding all of the tripods into a group folder called ‘3D models’, then drag the remaining layers into another group folder labelled ‘Foreground FX’. Next, select Layer > 3D Layers > New Layer from 3D File and navigate to Explosion.3ds from the CD. This model was created by simply adding an ‘Explosion Deformer’ to some simple shapes in Cinema 4D. Position at the bottom within the ‘Foreground FX’ folder. Now access 3D Mode, set the Scale fields to 5 and position to the left. 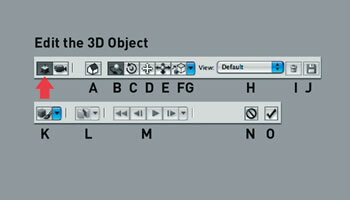 Duplicate the layer a few times, modify their positions in 3D space and shuffle their stacking order as shown. 12. To make the scene convincing, it’s important that the 3D elements interact with the 2D background. Add a new group folder below the ‘3D models’ folder and label it ‘Shadows’. 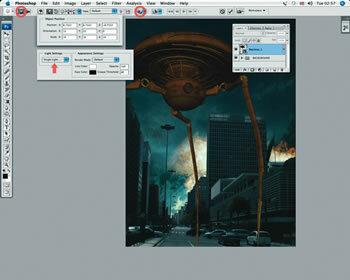 Generate a selection from the foreground tripod and fill with black on a new layer within the ‘Shadows’ folder. Set the blending mode to Multiply, drop the opacity to 60%, rotate the layer by 180°, flip it horizontally, then squash and distort it using the Transform Perspective tool. Now add more shadow layers using the same process. 13. 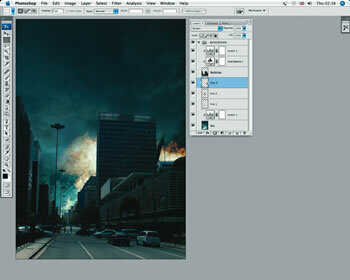 Add a new layer at the bottom within the ‘Foreground FX’ folder, and fill it with black. Now select Filter > Render > Lens Flare, pick the 35mm Prime preset and set the Brightness to 115%. Now set the blending mode to Screen, move it over the foreground tripod and label it ‘Lens flare 1’. Now add a Hue/Saturation adjustment, ticking Colorize, then setting the Hue to 0 and the Saturation to 32. Duplicate/scale the layer and move over the remaining tripods and label them accordingly. 14. The colours are too vibrant, so add a Hue/Saturation adjustment layer above all the group folders and use the following settings: red Saturation – -30; yellow Saturation – -65; Lightness – +18; green Hue – +41; Saturation – -38; cyan Saturation – -17. Add the helicopters as 3D layers in the distance, lowering their opacity to around 60%. The helicopter I’ve used can be downloaded for free from tinyurl.com/d5hvzm. 15. At this point I decided to add a car wreck to the foreground. The wreck image I’ve used can be downloaded for free from tinyurl.com/csbgbs. Open the image and use the Pen tool set to Paths to isolate the car. Then generate a selection from your path and copy and paste it into the ‘Background’ folder, clipping it to the ‘Buildings’ layer. Label it ‘Car’ and resize and position as shown. 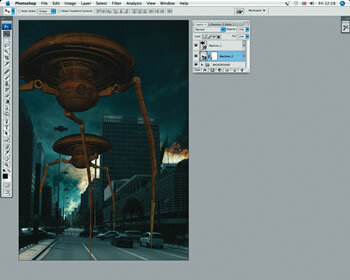 Now add a shadow layer, as detailed in step 12. 16. When you’re happy with the composition, go to each 3D layer in turn and select Layer > 3D Layers > Rasterize (or 3D > Rasterize in Photoshop CS4). Duplicate your first ‘Explosion’ layer, move it above the original and label it ‘Explosion blur’, then add a Motion Blur of 15 pixels and an angle of -24º, and set the blending mode to Lighten. 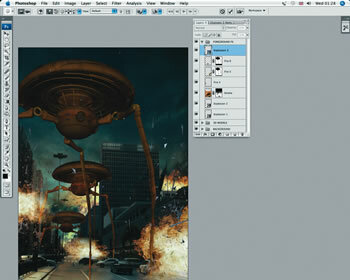 Repeat this for the other ‘Explosion’ layers and vary the effect by using the Soft Light blending mode. 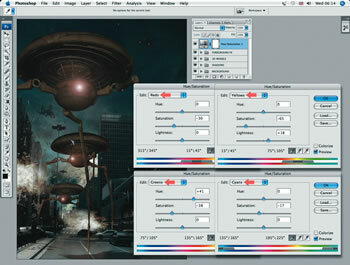 Fine-tune the image by using the Dodge and Burn tools on the ‘Car’ layer to match the scenes’ lighting. Finally, give the blades of the helicopters a slight motion blur and drop the opacity of the top Hue/ Saturation layer to 80%. You can modify the texture of any 3D layer by doubleclicking the sub-layer icon. This will open a child-document which can be edited using Photoshop’s tools. In order to update the changes on the 3D model, save the file and it will automatically update on the 3D model. To overwrite the original texture on your hard drive in Photoshop CS3, go to Layer > 3D Layers > Replace Textures. If you have Poser 7, you can export content using Content Exporter, a free public beta download: tinyurl.com/c78tf3. Photoshop Extended also supports other common 3D interchange formats, including KMZ (Google Earth/Sketchup), U3D (Acrobat 3D), 3DS (3D Studio) and DAE (Collada). 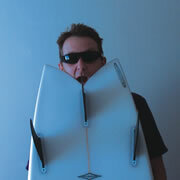 Who: Freelance illustrator and designer Mark Mayers is based in Cornwall. With over 18 years’ experience, he can recall life before Macs and is a reformed technophobe. He now writes tutorials for leading publishers worldwide, and has won awards including MetalFX Designer of the Year 06. On the CD: Files for this tutorial can be found on the cover CD.